LDA is delighted to be invited back to talk to hiblio about ticks, tick-bites and prevention of tick-borne diseases. This is scheduled to be live-streamed from Torbay Hospital at 2.00pm on Wednesday 22nd June 2016. 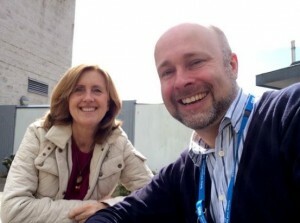 Paul Norrish, Founder and Digital Manager of hiblio will be talking with Dr Sandra Pearson, medical director of Lyme Disease Action (both pictured left) to raise public awareness at this important time of year when ticks are most active. We may even attempt to feature some live ticks on the programme if possible, just to show how small they are in real life. Some may remember that LDA had a previous conversation with hiblio in June 2014, which was not only their first live TV broadcast, but the first live broadcast by any NHS Trust. We look forward to working with hiblio again and hope this helps spread much needed awareness.